Soccer (as the Americans call it) is a sport that is full of passion, and any self respecting soccer club fan is going to stick to the club through thick and thin, that is for sure, never mind that it gets relegated down to the nether regions of the league in the country. 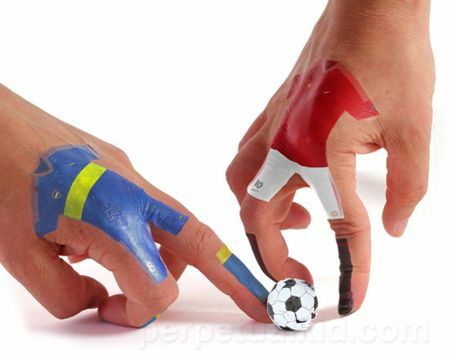 Well, if you felt that your hands were more talented in kicking a football than your feet, the $15.99 Soccer Finger Tattoos might be your cup of tea. Find another friend and you’re both set, never mind the need to figure out where the other 20 players are going to com from. Determine the final showdown between Messi and Ronaldo once and for all, as this set comes with 2 goals, 5 paper balls and 12 temporary team kit tattoos.